Merry Christmas!!! and cannot extol the utter glorious of this pud too much, I know that you’re unlikely to get through most of it, even half of it, at one sitting. Even though the steaming time is a bit lengthy (6 hours), the end result of this pud is very satisfying. You must now understand the reason behind my delayed posting. Phew, this pudding does take some time. Christmas pudding is a type of pudding traditionally served on Christmas Day (December 25) as part of the Christmas dinner. 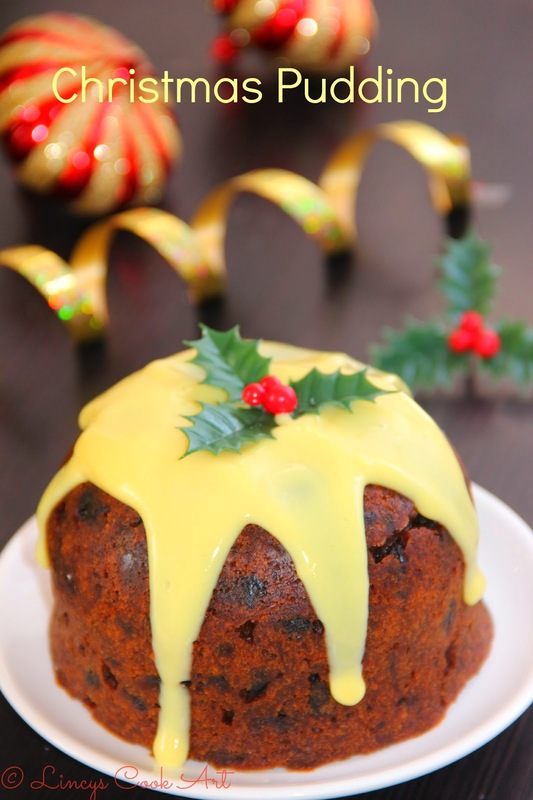 It has its origins in medieval England, and is sometimes known as "Christmas Pudding" or just "pud". The pudding is composed of many dried fruits and is held together by egg and suet (beef/mutton fat), sometimes moistened by treacle or molasses. Also, flavoured with cinnamon, nutmeg, cloves, ginger, and other spices. But my version is alcohol and suet free. Initial cooking usually involves steaming for many hours. To serve, the pudding is reheated by steaming once more, and dressed with warm brandy which is set alight. It can be eaten with hard sauce, brandy butter, rum butter, cream, lemon cream, custard, or sweetened béchamel, and is sometimes sprinkled with caster sugar. The pudding is aged for a month or even a year; the high alcohol content of the pudding prevents it from spoiling during this time. 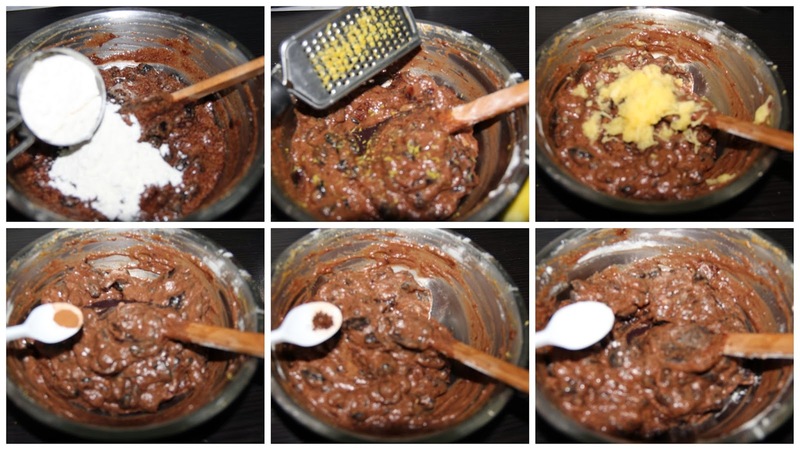 Make and freeze the Christmas pudding for up to 1 year ahead. Thaw overnight at room temperature and proceed as recipe on Christmas Day. I wanted to try this recipe for a very long time & that too alcohol free. Since i have not used alcohol i have done it the same time. Here in place of Pedro Ximenez Sherry (which is white wine that is normally used) i have made use of red grape juice & in place of vodka (poured over pudding and flaming vodka) i have replaced with lime juice in the pudding mixture (to get soft pudding). If you wouldn't mind alcohol, you could still use the original spirits. If you are planning to consume it on the same day a of 5 hours steaming is enough, but is you are planning to make it ahead & consume it after some time, steam first for 3 hours remove the aluminium foil & the parment paper then keep in a cool, dry place till the planned date, then steam it for 3 hours on Christmas Day. You can use any dry fruit of your choice like sultanas, raisins, black currants, prunes, dates...etc. 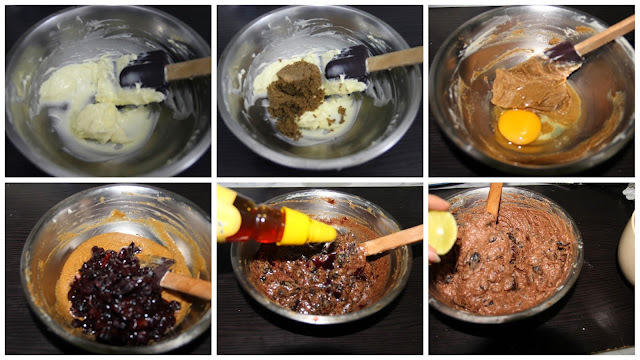 Do not be upset, you will not get any smell like baking of cakes when steaming. Once you remove the foil & parchment Oh My God the smell of the pud so..... amazing. You will need a 700ml-1 litre heatproof plastic/ ceramic pudding basin/bowl, and also a sprig of holly to decorate. Three hours’ steaming both first and second time around should do it. After it’s had its first steaming, and is cooled, follow with the with the same steaming instructions for Christmas Day. 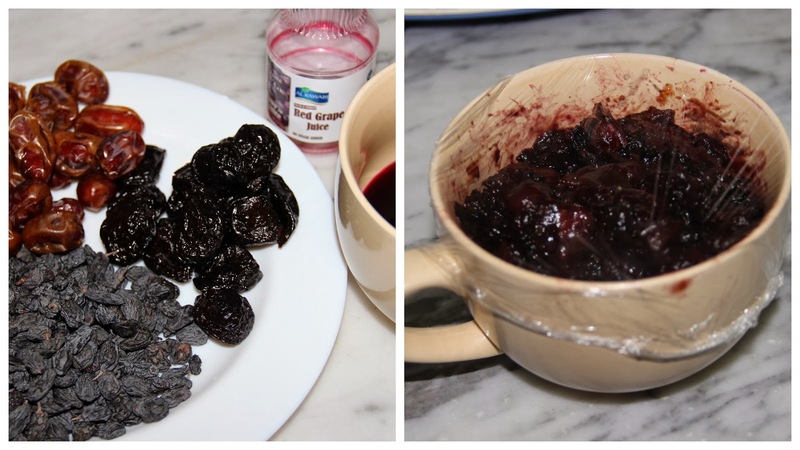 Put the raisins and prunes, dates into a bowl with red grape juice, swill the bowl a bit, then cover with clingfilm and leave to steep overnight or for up to 2days in fridge. When the fruits have had their steeping time, put a large pan of water on to boil, or heat some water in a conventional steamer (here I have used idli steamer), and butter your heatproof pudding basin. In a large mixing bowl, beat the butter until creamy then add the brown sugar beat well till creamy. Then add the egg and beat well. After that add the fruit mixture kept for steeping. Add the all purpose flour, cinnamon, cloves, lemon zest and juice, baking powder, apple, honey and bread crumbs. Combine all the ingredients, and stir well. Scrape and press the mixture into the prepared pudding basin, squish it down and cover with the buttered wax paper. Then wrap with a layer of foil and tie tighly with a string, so that the basin is watertight, then either put the basin in the pan of boiling water (to come halfway up the basin) or in the top of a lidded steamer (this size of basin happens to fit perfectly in the top of my idli steamer) and steam for 3 hours, checking every now and again that the water hasn’t bubbled away. When it’s had its 3 hours, remove carefully without burning yourself and, when manageable, unwrap the foil, and put the pudding in its basin somewhere out of the way in the kitchen or, if you’re lucky enough, a larder, until Christmas Day. On the big day, re wrap the pudding (still in its basin) in foil and steam again, this time for 3 hours. Six hours combined cooking time might seem a faff, but it’s not as if you need to do anything to it in that time. 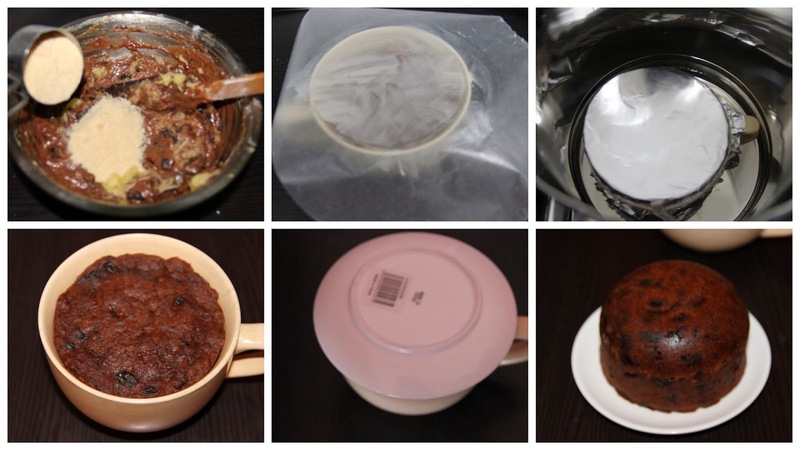 To serve, remove from the pan or steamer, take off the foil, put a plate on top, turn it upside down and give the plastic basin a little squeeze/ tap the ceramic powl to help unmould the pudding. Put the sprig of holly on top of the dark, mutely gleaming pudding. Serve with the Eggnog Cream, or Custard which you can easily make - it's the work of undemanding moments - while the pudding's steaming. Awesome lincy. Really yummy recipe and beautiful photography. yes as poorni said..beautiful clicks..For me,its clear presentation..Will love to check out for baking in ur blog itself. Delicious christmas pudding Eliza, Love it. Thanks for sharing with Favorite recipes Christmas recipes event. Thank u Arthy and wishing you the same. Simply divine.Thanks for sending it to Lets cook party food for christmas.